Pour on the Fresh Flavor! From the robust flavor of Extra Virgin to the mild and light flavor of Originale and Extra Light, STAR Olive Oil has been a market leader for over 100 years. 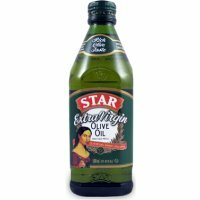 STAR olive oil is unmatched by any other cooking or salad oil. Its distinctive taste makes it a perfect as well as healthy substitute for butter or margarine in virtually any recipe.